Last night Jeffrey was so loving my hair, he wanted to celebrate. He went out and bought me some good ol' Cafe Rio (the quickest way to a woman's heart... or maybe just mine) and whipped out a Cary Grant Movie. 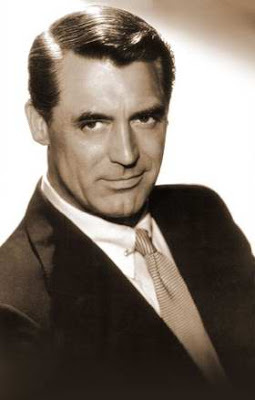 *Sigh* I love Cary Grant. He is divine. And since Jeffrey isn't a fan of chick flicks, this was rather a surprise, but then I saw a pink submarine, and realized it was a WWII Cary Grant movie, which pleased us both immensely, and we both enjoyed the night. Then we fell asleep to the gentle rumblings of our downstairs neighbor's snores (sounding much like thunder) and the lulling nocturne of the rain on the windows and roof. Ah, what a sweet sweet night. Oh, and Keith took a nap from 5 until 7 :30, so I thought I would let him stay awake until he acted tired. When he pulled out a blanket and pillow from the basket in the corner at 9:30 and said "Night night." I knew it was time for him to go to bed. Is that how you determine your child's bed time? Please tell me I am not the only one. yay!!!!! so darling, darling, darling! I saw you on SITS and I thought that I would pop in and say "hi!" I really like your hair - looks great! Can you believe that I've never seen a movie with Cary Grant in it? I know! Shame on me. Have any suggestions of where I should start? are you talking about operation petticoat?? that is such a great movie! Thank you, such a sweetie. Yes, I was talking about Operation Petticoat. I really like that show. Cary Grant is a master, that is for sure. I love your hair! And Cafe Rio is the quickest way to a woman's heart. Have you tried their pork salad? TO DIE FOR!